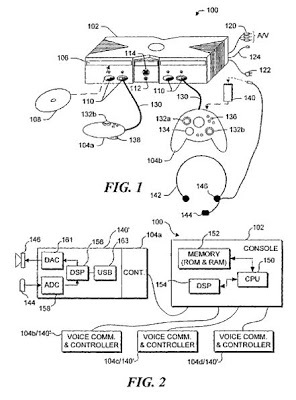 The ‘582 patent provides a way for players, during online gaming, to communicate with other players. The invention establishes a system where players can select an opposing player or teammate with which to communicate. The player can then send a personal message to the other player and enter into a private chat. This allows the two players to communicate solely with each other and not be overheard by the other players. This invention also cuts down on the nuisance of the other players since the player can easily block any player who is offensive or disrespectful toward the player. A game console capable of communicating with other game consoles over a link or network is provided with a headphone and microphone for each player who will engage in voice communication. Verbal communications directed to one or more other players are converted to pulse code modulated (PCM) digital data and are encoded and compressed in real-time, producing data packets that are transmitted to another game console. The compressed data packets are decompressed and decoded, producing PCM data that are converted to an analog signal that drives a headphone of the intended recipient. Players can selectively mute voice communications to and from a specific other player. The PCM data can be encoded in a round-robin fashion that reduces the number of encoders required. A predefined level of computing resources is used for voice communication to avoid aversely affecting the quality of game play. 1. A method for encoding a plurality of audio channels during play of an electronic game, using at least one encoder, but fewer encoders than audio channels to be encoded, each encoder encoding audio signals in an active audio channel and producing corresponding data packets for transmission to at least one recipient participating in the play of the electronic game, comprising the steps of: (a) creating a round robin history of the audio channels that have been encoded by the encoders during successive processing intervals; (b) if more than one audio channel per encoder are simultaneously active, selecting an audio channel to encode with each encoder based upon the round robin history and on the audio channels that are then active, so that an audio channel that is active will be skipped and not encoded more frequently than every other processing interval; and (c) updating the round robin history for each processing interval to indicate each audio channel that was encoded during the processing interval.